1. 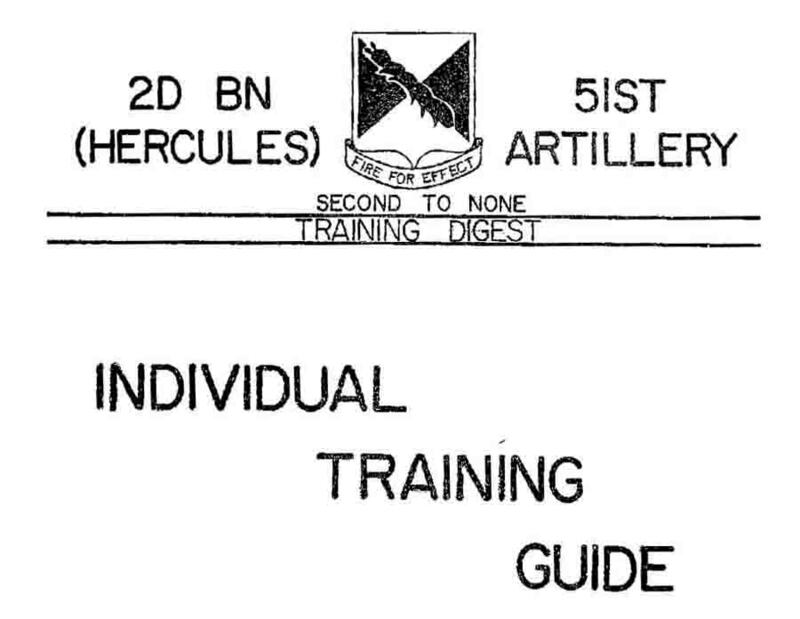 Attached Individual Training Guide is forwarded as an aid to all personnel in preparation for questions to be expected during this summer’s AGI and CI inspections. 2. All individuals will familiarize themselves with questions, answers and statements contained in the guide. A good portion of the information is applicable to assignments in other commands particularly in overseas areas. 3. The guide is not all inclusive; suggestion for changes, additions or deletions are welcomed. Q. What is the purpose of the Acquisition Radars? A. Detects a target and presents it on the PPI, PI and "B" scope. Q. What is the purpose of the Target Tracking Radar? Q. What is the purpose of the Missile Tracking Radar? A. Tracks the missile by the missile beacon and continuously sends missile position information to the computer. The MTR also relays steering and burst commands from the computer to the missile. Q. What is the purpose of the computer? Knowing the location of both target and missile continuously, computes a kill point. Directs the missile to the kill point. Causes the burst command to be sent at the appropriate time. Q. What are the major items of equipment of the Fire Control Platoon? A. (1) Director Station, (2) Tracking Station, (3) Missile Tracking Radar, (4) Acquisition Radars (Lopar & Hipar), (5) Target Ranging and Target Tracking Radars. Q. What are the major portions of the Director Station? A. The director station houses the a. Computer b. Battery Control console c. Communications Switchboard. Q. At what speed and range is the Nike Hercules System effective? A. Excess of 2,100 miles per hour (Mach 3) and in excess of 75 miles. Q. At what altitude is the Nike Hercules System effective? Q. At what Equipment Status is the Nike Hercules System in when ready to fire a missile? Q. What is meant by "Blue Status" checks? A. Those checks that must be completed to assume a "prepare to engage status. Q. What is the overall length of the rounds? Q. What is the gross weight of the round? Q. What is the overall length of the missile? Q. What is the gross weight of the missile? Q. What is the weight of the missile propellant? Q. What is the overall length of the Rocket Motor Cluster? Q. What is the weight of the Rocket Motor Cluster? Q. What is the approximate burn time of the Rocket Motor Cluster? Q. What is the thrust output of the Rocket Motor Cluster? Q. What is the weight of the Rocket Motor M30? Q. What is the thrust output of the Rocket Motor M30? Q. What is the approximate burn time of the Rocket Motor M30? Q. Where does the Hydraulic Pumping Unit get its power in flight? A. From the BA485, a 28 volt squib activated dc Battery. Q. Which are the storage requirements for arming Mechs and initiators? A. In right front of magazine, not in the same magazine as the igniters are stored. Q. Will the number of warheads above ground in their containers restrict the number of rounds above ground? In an emergency what are the four life saving steps? a. Stop the bleeding, b. Clear the airway, c. Protect the wound, d Treat for shock. A blister agent splashes in the eye. What self-aid measures should be taken? a. Flush eyes with water, b. Report to nearest medical aid station. What are some of the signs and symptoms of shock? a. Eyes vacant and lack luster, pupils dilated. b. Lips dry and pale; there may be nausea. d. Skin pale, cold, moist and clammy. What is the shock position? a. With the head lower than the feet. How would you control hemorrhages? a. Pressure, b. Pressure pressing, c. Tourniquet, d. Elevation. What is a closed fracture? a. A break in the bone without a break in the overlaying skin. What are the three classifications of burns? a. First degree, b. Second degree, c. Third degree. a. Skin is destroyed or charred with injury extending to tissue. How should the phase I set be positioned? a. So that access can be gained by anyone. What are some of the measures useful in the prevention of all types of heat injuries? a. Drink plenty of water, b. Take extra salt when needed, c. Work during cool hours of the day, d. Dress to suit weather. In what parts of the body should you inject the atropine syrette? a. In a large muscle. Mouth to mouth respiration is the most effective? One of the purposes of splints is immobilization? Once a tourniquet is applied you are allowed to loosen it after 30 minutes? When there is no other way possible to stop the bleeding would you use a tourniquet? Q. What are the two requirements to be fulfilled before access to classified information is given? A. Proper clearance and a need-to-know. Q. What security classifications are authorized? Q. What is a DA Form 727? A. A form used to identify responsible persons in case a safe is left open and also to record a safe combination. Q. If a stranger not on an access roster seeks access to a restricted area what action should a sentry guard take? A. Send the man to the battery orderly room. Q. What is the proper action when taking a classified document from a safe? A. Make sure it is receipted for and a proper DA Label is placed on top. Blue (Confidential), Red (Secret), Yellow (Top Secret). Q. What is DA Form 672? Q. When must a safe combination be changed? A. The loss or possible compromise of the combination, once a year or whenever a person having knowledge of the combination leaves the unit or receipt of a container. Q. What are several protective markings authorized? A. For Official Use Only, Restricted Data, Formerly Restricted Data, Modified Handling Authorized. Q. Describe how you would check the locking of a safe containing classified defense information. A. Turn the dial in one direction at least four (4) turns, try each drawer to be sure it is locked, enter the date, time checked and your initials on DA Form 672. A. Subversion and Espionage directed against the US Army. Q. Whose responsibility is it to brief your dependents on SAEDA? Q. What are the peace time safety rules? A. See ARADCOM Reg 381-1-1. Q. What is the two man rule? A See ARADCOM Reg 381-l-l.
Q. Who is authorized to destroy classified defense information? A. The duly appointed custodian or in his absence the alternate custodian. Q. Whose responsibility is it to safeguard classified defense information? Q. Can you discuss classified defense information over the battery radio and telephone nets? A. No; the telephones and radio are not secure. Q. Can you be armed with a weapon that you have not fired? A. No; each individual is required to either qualify or fire familiarization with the weapon with which he is armed. Q. You have a key to the LCT and you are going off duty. Are you authorized to retain the key overnight in your possession? A. No,; all keys must be controlled so you must turn the key into the key custodian. Q. When are you authorized to fire your weapon? A. See ARADCOM Reg 380-1. Q. Describe the Emergency Forces in the Launcher area; how many men are they composed of, and how long do they have to respond to an alarm? A. See ARADCOM Reg 380-l-l.
Q. When can the safe plug be removed from the missile? A. When directed by TM for tests, and when authorized to install the Arm Plug. Q. When can the Arm Plug be installed? A. When directed by TM for tests, 5 minute or higher status with proper case and Swift Kick II. Q. When can the mission plug be removed? A. Only when directed by TM, ie, for tests and disarm procedures. Q. If a weapon is engulfed in flames would you fight the fire? A. Only for Humane reasons. Q. What action is taken when an M30A1 (arming Mech) is found armed? A. For M17 - Close access door, evacuate the area and call EOD. A. For other type Warhead - Perform emergency disarm procedures. (Do not attempt to remove M30A1) Evacuate the area and call EOD. Q. What action is taken if an S-31 switch is found armed? A. Evacuate the area and call EOD. (1) A dropped arm plug? (2) A dropped safe plug? (3) A dropped mission plug? Q. Peace time Safety Rules? A. Unit personnel must know all of these. Q. Can a safe plug from an adjacent missile be used in the absence of a spare safe plug? Q. Which type of warhead will be used for case III? For Case II? For Case I? A. For for case III, XL or XS for cases I and II. Q. What would you use to clean receptacle J3 of the cartridge assy? A. A toothpick moistened in trichloroethylene. Q. How would a baro probe marked "PAD" be cleaned? Q. How will a cable with vinyl sleeving be cleaned? A. With clean cloth and toluene. Q. How many 5 pair cables are attached to the LCG? A. Three 5 pair cables and 1 spiral four. Q. What is the battery charger chasis in the bottom of the section simulator group now used for? A. Power for the Heat Monitor Lights in the section. Q. What reference is used for the setting of the Launcher Orient Resolvers? 2. When directed to do so by a Superior Officer in the guard chain of command. 3. To prevent the commision of a felony. 4. To prevent the escape of a person taken into custody for the commission of a felony. 5. To apprehend a person seen setting fire to, damaging, or destroying Federal Property. 6. To apprehend a known dangerous criminal. 7. To alert the back-up force. 2. Army serial number is the same as on access roster. 3. I.D. serial number same as on Access Roster. 4. Name and Rank same as on Access Roster. 5. Signature same as on sign-in sheet. Subversion and Espionage directed against the U.S. Army. Security and safe keeping of a Nuclear Weapon. No less than two (2) men shall have access to a Nuclear Warhead and both shall have equal knowledge of the job to be performed and the safety and security requirements. Internal Defense Act enacted in 1950 giving legal authority and jurisdiction to Security Forces guarding Nuclear Weapons. Telling who will be admitted access and who will not; and how the weapon will be guarded and kept safe. 2. Shout halt three (3) times, on third time load you weapon. 3. If close enough attempt to apprehend using physical force. 4. Fire a shot into the air. 5. Shoot to wound (legs). HUMAN RELIABILITY FACTOR: Takes into account whether a man, (A) Drinks too much, (B) Gambles too much, (C) Talks too much, or any other character trait which may be used to make the man give information about his job, missile, unit or the U.S. Army. The new FM 22-6, 1 May 1967 will be effective Army wide on 1 August 1967. This manual supersedes FM 26-5, 21 August 1956. No. 1. I will guard everything within the limits of my post and quit my post only when properly relieved. No. 2. I will obey my special orders and perform all my duties in a military manner. No. 3. I will report violations of my special orders, emergencies, and anything not covered in my instructions, to the commander of the relief. a. Efforts to collect unclassified military publications. b. Attempted entry of restricted military reservations. c. Clandestine efforts to obtain highly classified technical information. d. In overseas stations, direct approach operations have been numerous. a. Overt attempts to obtain information. b. Professed cultivation of friendships. c. Efforts to place individuals in compromising positions in order that the threat of pressure might produce the desired collection of U.S. military information. (3) Personal contact with military personnel and civilian employees of the U.S. Army. (4) By use of audio surveillance devices. b. Attempts of Individuals with known espionage, subversive, or Sino-Soviet backgrounds to cultivate friendship with military personnel and civilian employees of the U.S. Army, or to place them under obligation. 4. Occurrences or anything resembling the occurrences just discussed must be reported immediately to your immediate superior, or commanding officer. Pending further instructions, the occurrence must not be discussed with anyone else. Superiors and commanders receiving this type of information must report the information as expeditiously as possible to their commanders in order that the Commanding General, Sixth U.S. Army, or his representative the Sixth Army G2, will receive ultimate notification. 5. If at any time you should suspect that you are the object of recruiting efforts, avoid firm commitments and defer any answer pending a future meeting with the contact. Any identifying data you can procure will be of great assistance. Indicate you may give the matter some thought and and would like to think it over for a few days. Do not attempt to exploit apprehend, restrict or stimulate the contact until proper guidance has been received from intelligence authorities. 6. You are reminded that the Sino-Soviets are without question quite active within the United States in the field of espionage. Undoubtedly, there are espionage agents within this army area, and we suspect they could increase in number. You may find yourself in a position to make a valuable contribution to the security of our country. It could be you who furnishes us with the particular load we might need to identify an espionage organization. The intelligence and common sense you display upon your initial contact with such occurances could make a substantial difference in the conduct of the investigation which might follow. 7. To repeat, if you are approached, merely indicate that you went to think it over for a few days and meet again. Immediately notify your superior or commander who will assure that the information is reported expeditiously through intelligence channels. The information will be handled on the strictest need-to-know basis. The information will be held in confide until guidance from Sixth Army has been received. AR 381-12 requires commanders to encourage their subordinates to report such incidents and that commanders emphasize the protection and guidance that personnel reporting will be afforded. 8. This program is not a new one, but Department of the Army has reasons for stressing it at this time. Each person must realize the part he can play if he should run across apparent espionage attempts. It must be understood that there are relatively few American intelligence personnel and of course their personal coverage of areas and activities is limited. A great amount of such information of necessity must be obtained from persons not directly connected with intelligence. 9. By no means do we want you to spy on your associates, nor do we want you to report remarks against the Republicans, the Democrats the present Administration, or any specific laws, since it is the right of Americans to so criticize if they desire; however, consistent praise for Russia and communism on one hand and pointed derogatory remarks about the American form of government on the other, may be a case of sedition to say the least. 10. Do we have a need for security? Yes. Enemy intelligence is continuously, ìndustriously, secretly and ruthlessly engaging in efforts to gather political, social, economic, industrial and military information of tactical and strategic value. 11. How can personnel indifference to security requirements best be overcome? Through continuing, thorough security orientation; strong leadership; frequent inspection of security systems and procedures; and disciplinary action and reward. 12. Why is enemy intelligence always interested in collecting background data concerning personnel in sensitive or key positions? In order that this knowledge may he exploited to their advantage. Through coercion, duress, etc., Character degenerates, disaffected personnel, disloyal persons, deviates, etc., can be caused to cooperate in manners inimical to the best interests of the United States. Additionally, background information concerning commanders is useful in determining how the commanders may react in a combat situation. 13. Why should seemingly minor incidents pertaining to security matters always be promptly reported through intelligence channels? Because they frequently form a pattern indicating enemy efforts when similiar minor reports are centrally collected. Knowledge of this pattern is used to neutralise enemy penetration efforts. 14. How strict should security requirments be? Never so stringent that the unit cannot accomplish its primary mission or that dissemination of information cannot be expeditiously made to those who need-to-know. Common sense should always be applied in considering capabilities, funds, manpower, time element, situation, mission, and degree of classification. 15. Should "honor systems" and "short cuts" in accountability of classified information be used? Possibly in emergency situations. Otherwise, laxity in security procedure can only result in risk of loss, theft, or compromise of defense information. Additionally, this laxity frequently results in embarrassment or disciplinary action. 16. With who does the responsibility for security rest? It rests with the individual commander. However, responsibility for safeguarding classified defense information rests with the individual having custody. Q. At what time from "Blazing Skies" will a unit be scored as unsatisfactory for the time to launch portion of the ORE? A. Time in excess of 20 minutes (Ref Item App B, Pg B-8, ARADCOM Regulation 350-l-5) dated 16 March 1967. Q. Simultaneous tracking test will be performed at what ranges and what is the tolerance? A. Inter-area cable (47) is out-of-action. Q. The MTR upon completion of the "ALERT STATUS" will be locked on the flight simulator and will remain in this condition until the RC VAN Evaluator instructs the operator otherwise. Q. If the TTR Long Pulse is Non-operational, the battery will be Non-operational during an ORE.
Q. ARADCOM crew drill procedures are prescribed in what directive? Q. Conduct of an ORE is prescribed is what directive? Q. What is the primary purpose of the Target Ranging Radar? A. To furnish range information during an ECM environment. Q. What is the purpose of the AN/MPQ-T1 simulator? A. To provide simulated conditions which will permit training of operators. Q. What are some of the simulated conditions the T-1 can provide? Q. What DA Form is used by the operator to record any trouble or out of tolerance condition when performing the periodic checks (daily, 6 hour etc.)? Q. As an operator performing daily checks on a piece of equipment where would you find the tolerances for that equipment? A. In the pertinent Technical Manual. How often do you have gas chamber exercises? Once a year. What is the maximum time for masking? Nine seconds. How many Atropine syrettes can you give your self? Three. What agent is the Atropine syrette used for? An antidote for nerve agents. What first aid can be used against choking agents? Inhalation of amylnitrate and artificial respiration. What is the AN/PDR-27 Radiac Set used for? Monitoring personnel and equipment and for decontamination. How can radiation be detected under field condition? With Radiac instruments. If fallout has occurred on your unit area under field conditions, how long should you remain under cover? Until the all clear has been given through command channels. What are the three types of nuclear explosions? Air burst, Surface Burst, and Sub-Surface Burst. What is the best individual protection from radioactive contamination if the individual must remain in the contaminated area? Stay in a shielded area such as a building, bunker, launcher underground magazines and Radar vans. What is Danc and D-S2 used for? Decontamination of unit equipment. What could you use to decontaminate small droplets of liquid chemical agents on an individual? M-5 Ointment or soap and water. How often is the protective mask to be fitted and checked? Once a month. What are the three effects of a nuclear burst? Blast, Heat, (Thermal Radiation), and Nuclear Radiation. How long (after a chemical attack) should water be boiled before drinking? Thirty (30) minutes. What is the shape of CBR decontamination markers. The shape of a triangle. a. Information to personnel. Standards of Conduct and Army Command Policy and Procedure will be brought to the attention of all Department of the Army Personnel (Military and civilian) upon employment or entry on duty and at least semiannually thereafter. b. Reporting suspected violations. DA personnel who have information which causes them to believe that there has been a violation of the Standards of Conduct or Army Command Policy and Procedure will promptly report such incidents to their immediate superiors. c. Standards of Conduct and Army Command Policy and Procedure prescribes the standards of conduct required of all Department of Defense Personnel. Close adherence to high ethical standards is demanded of all public servants. Q. Under what conditions are members of the Army prohibited from participating in public demonstrations (i.e. picket lines and civil rights marches)? (1) During the hours they are required to be present for duty. (2) When they are in uniform. (3) When they are on a military reservation. (4) When they are in a foreign country. (5) When their activities constitute a breach of law and order. (6) When violence is reasonably likely to result. Q. Under what conditions may members of the Army engage in private outside employment, with or without compensation? A. (1) When it does not interfere with their government duties. (2) When it may not be reasonably expected to bring discredit upon the government. (3) When there is no possibility of a conflict between private interests and the public interests of the United States. (4) When such employment does not interfere with the customary or regular employment of local civilians in their art, trade, or profession. (5) When subject employment is approved by the unit commander. Q. What is the rule concerning bribery and graft? A. In general, members of the Army may be subject to criminal penalties if they solicit, accept, or agree to accept anything of value in return for being influenced in performing or in refraining from performing an official act. Q. What is the rule concerning contributions or presents to superiors? A. (1) No officer or employee in the US Government shall at any time solicit contributions from other officers or employees in the Government Service for a gift or present to those in a superior official position. (2) Nor shall any such officials or superiors receive any gift or present offered or presented to them as a contribution from persons in government employ receiving a salary in an amount smaller then their own. (3) Nor shall any officer or employee make donation as a gift or present to any official superior. The 5lst Artillery Regiment was the second organization in the Army to have its coat of arms approved by the War Department. The colors of the shield are red and gold. The red denotes Artillery while the gold indicates service in Lorraine, during 1917 - the color is taken from the coat of arms of that Province. The green caterpillar is used to symbolize the tractor - in France, regimental transportation was tractor drawn and vehicles were marked with a device consisting of a camouflaged gun drawn by a caterpillar. Also on the coat of arms is an ancient heraldic device known as a lion’s face jessant-de-lis. The red lion's head indicates service during the War of 1812 and the fleur-de-lis commemorates service in France during World War I.